Getting long in the tooth means we’ve lived a long and hopefully happy life, right? Right! But what happens if we get long in the tooth prematurely? Not age wise, but tooth wise? Well, we may have what dentists call gingival recession. We laypeople call it receding gums or shrinking gums. In this article, we’ll fill you in on why you might have this dental condition and what you can do about it. Hold up yourforearm and hand, palmand forearm towards you in a vertical position. Imagine your hand as the crown of a tooth. Imagine your forearm as the root. Now pull your (long) sleeve up around the very bottom of your palm and hold it tight. That’s the way your gum tissue should fit around all your teeth. Now, pull your sleeve down a bit on your wrist and leave it a tad loose. That’s the beginning of receding gums. Pull it down some more and you’ll see more and more of the root (your wrist). Now imagine how that makes your “tooth” look longer. That’s pretty much how it works in your mouth. There are three main symptomsassociated with this oral condition. Aesthetics:Gingival recession causes the teeth to appear longer than they really are. The exposed root surfaces areyellow and cause the teeth to appear discolored. TeethSensitivity: The exposed roots are not protected by enamel like the crown.“Nerve” endings on the root surfaces react painfully to hot and cold temperatures. Increased Dental Decay:Tooth roots are considerably softer than the crowns. This makes them more susceptible to cavities. Tooth decay on roots is often very difficult to fix. 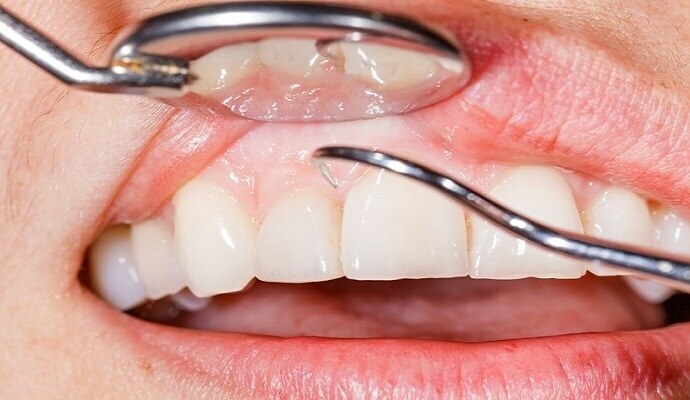 Always check with your dentist for a proper diagnosis as some forms of gingival recession are secondary to gum infection, which can cause tooth loss. Periodontal disease (pyorrhea, gum disease). Surgery for periodontal disease to correct bone loss around teeth may resultin gum recession. Improper tooth brushing: using a horizontal sawing action while brushing the teeth. Restorations (fillings) that go below the gum line. Hormonal changesmay predispose the gum tissue to shrinking. Pregnancy gingivitisand puberty gingivitis (both gum inflammations) are two examples of hormone-sourced gum recession. Partial dentures with poor design: the clasps that attach to teeth may impinge on the gum tissue. Some drugs, including cocaine, when rubbed on the gums may irritate them and cause gum shrinkage. High frenum attachments. The “stringy” band of tissue that goes between your upper and lower front teeth (and other teeth) from the lip, may tug too strongly on the gums and cause gum recession on the involved teeth. Lip and tongue piercings may rub on gum areas during talking and eating. Heredity: some studies show a hereditary factor for gingival recession. Periodontal disease must be addressed with scale and clean or surgery. Early interventions will limit the amount of gum shrinkage.Corrective procedures may cause gingival recession but prevent tooth loss.Correction of any gum recession may be addressed after surgery. Improper tooth brushing is easily corrected by learning the correct methods. Gingival recession may not be avoided in someindividual orthodontic cases. Excessively rapid orthodontic tooth movement may result in recession. Inadequate oral hygiene practices from wearing braces may also contribute to gum shrinkage. Bruxism has various treatments, but the most common,similar to a sports guard, is an occlusal or “nightguard”. Crowded teeth treatment is orthodontics. However, lacking finances for orthodontic treatment, meticulous oral hygiene may prevent or reduce gingival recession. Stop smoking and you will not only reduce gingival shrinkage but, vastly more important, reduce or eliminate your chances for devastating medical diseases! Fillingscan be evaluated and repaired or designed to not impinge on gum tissue. Sensitivity may be addressed by using a desensitizing toothpaste or application of desensitizing substances by a dentist. Hormonal changes can be managed by consultation with a dentist at the first sign of gum inflammation. Partial dentures that cause gingival recession can be altered to prevent damage to gum tissue. High frenum attachments can be surgically corrected. Piercings: remove or relocate piercings. Heredity: if hereditary factors are suspected, immaculate hygiene and frequent dental checkups may reduce gingival recession. There are several products that advertise as being able to “grow your gums back”. Once your gums have receded, they will not “grow back”. Instead of wasting your money on some unproven nostrums, put your money toward a proper receding gums treatment listed in this article. At Dental Guide Australia https://www.dentalguideaustralia.com we’ll never shrink from our mission of providing you with interesting and helpful quality dental information. Check us out!